I wish that the Tiger year will bring to all of us Health and Happiness. I didn’t post since almost one month. It was the winter break and I enjoyed some vacations abroad with my Queen (I will post some pictures in a very near future). Now, it’s time to be back to work, the new semester started this week. Having not watch or read news about Taiwan since a while, I decided to have a look, during a coffee break. Is the ECFA still the top priority? Is Chinese influence on Taiwan society still a concern? News respectively answered: No, Yes and Yes. Democratic Progressive Party (DPP) legislators yesterday voiced concern that national security might be compromised after a major contractor for government information systems was bought using Chinese capital (last month). Not only the Premier said he didn’t know anything about the Data Systems issue (it seems that he is sharing the “I didn’t know” with the President Ma – see below), but the Minister of Economic Affairs rebutted the allegation (security concern). Still, a clear fact according the news is that this company is run by Chinese money. About people not knowing what is going on, more in the news (HERE). The Taipei County Magistrate Chou Hsi-Wei announced few days ago his withdrawal from the new special municipality (former Taipei County) elections. It seems that other candidates from the same party (KMT) were leading several polls. Anyway, during his speech, Chou said that he spoke twice about the case, with President Ma (who is also the chairman of the party). But Monday, the President said that he only knew about the case after reading the newspapers. As the previous story (see above), one more who “didn’t know”. If a president rules the country by reading the newspaper, then it would be better to seek a newspaper chief to serve as president. Some have mocked Ma on the Internet that he only knew he was elected president after reading about it in the paper and that the first step when China invades Taiwan will be to destroy all newspapers so that Ma will know nothing about it. Obviously a new modus vivendi is taking force in Taiwan. Less funny: according other news (HERE), the Ministry of Education may emphasize the teaching of Chinese history and reduce the teaching of Taiwan and the rest of the world history. National Taiwan University (NTU) professor of history Chou Wan-yao, who is one of the members of the task force, raised concerns about changes to the curriculum guidelines [in an article published in the Southern Newsletter on Feb. 10]. the new [Chinese Nationalist Party (KMT)] government would like to set things straight by amending the curriculum guidelines for Chinese literature and history. President Ma Ying-jeou (馬英九) on Tuesday touted his foreign policy, saying that the rescue efforts of Taipei and Beijing in Haiti were a perfect example that his strategy of “diplomatic truce” with Beijing worked. His plane brought aid goods. Where did it land in the first place in view to deliver the aid goods? Haiti is an diplomatic ally. So why Ma did not land on Haiti land? So, why did he need to give the aid goods to Haiti from the Dominican Republic? China can decide about the U.N. troops in Haiti. So the president (?) of Taiwan which is a diplomatic ally of Haiti cannot land in Haiti. And he still repeat and repeat how beautiful and successful is his diplomatic truce. China decides. Obviously, not Taiwan. Yeah… Diplomatic truce… A joke? If I missed something or misunderstood something, please, let me know. I will give today my one cent comments about the former two points and let the latter to a future post. Obviously, no one can oppose to that fact. 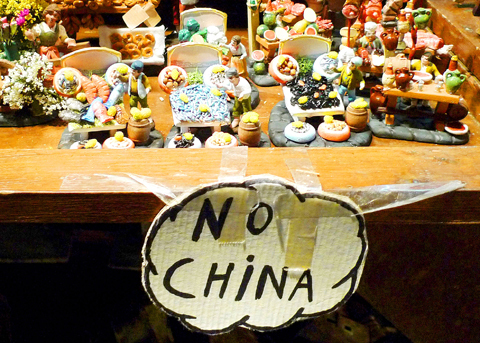 For foreigners living in Taiwan, it is always a strange, ridiculous, funny (?) and dangerous show to see legislators insulting each others and fistfights on a regular basis. What’s an example about Democracy which people are supposed to develop and cherish. As a remedy, the new appointed Chinese Nationalist Party (KMT) Secretary-General King Pu-tsung is in favor to the assignment of a sergeant-at-arms to the legislature (and it) would be in keeping with a practice in western countries that effectively helps to enhance democracy (HERE and HERE). So, what is he supposed to do? Fire on the bad legislators to bring back calm and peace? Beside, create a low enforcement system as suggested by the KMT is a way to belittle the Legislature’s autonomy. One more way for the party to totally control everything? That is not only very strange to say that, but it is also not accurate. Let’s take the example of France (but it is very similar in all democratic countries). If you go to the French Legislature Website (HERE – in French but Google can easily translate it) we can see that yes, there are military, police and firefighters staff inside the buildings. The President of the Legislature is the ONLY responsible of the security inside the buildings and only him can decide. Not the main political party or the government. The forces are only there to protect the Legislature from people coming from outside to interrupt sessions or to launch attacks. In no ways those forces are there to separate legislators in case of clashes. And the autonomy of the Institution is totally preserved. I totally condemn violence whoever started it, minority or main party. It is totally unacceptable. But what if it is the only one way to bring public attention to an unacceptable proposed bill which could put down the spirit of democracy (as said by some)? I don’t know. It’s a very complicate and sensitive question especially if people are normally in favor of democracy and against any form of violence, which is deeply my case. 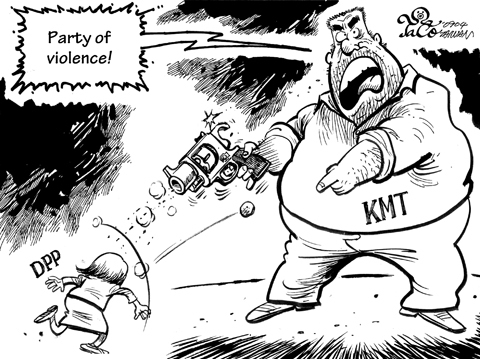 Beside, according the news, it doesn’t seem that the DPP (minority) is more violent than KMT. There are more news about KMT elected convicted for vote buying or linked to the mafia. And recently, a KMT candidate who lost the election came with a gun to the headquarter of his opponent (who won the election). There are so many examples from the newspapers but it is not the point here. The controversial bills were voted during the clash according the news. Minority should abide by the majority? I thought minority should abide by the law (as the majority…). Laws govern a country. Not the majority. Yes, I know what you will say: laws are voted by the majority. Right, but there is still a subtle nuance worthy to note. Beside, I am not sure that the fact that there are main and minority parties is an evidence that a clean democracy exists. Even in western countries such as France and USA we may have a lot of questions. What do people get? Democracy? I am not sure. Last Sunday, Taipei Times published an interview its reporters made with the Taiwan President Ma Ying-Jeou (HERE). I thought the biggest problem about the bill was about the appointment of local district chiefs who are already in post, without letting the possibility to the new elected mayor(s) to chose his/her staff. I also understood from the news that most of those chiefs are from the KMT. Why not let the public and legislature know what is going on about the negotiations before they are done? You can also notice that he used the term “mainland China”. So when we sign FTAs, we can do it with our major trading partners, such as mainland China, Japan, the US, ASEAN countries, the European Union, South Korea and Singapore. Can you really believe that after signing an ECFA, China will let Taiwan signs FTA with other countries? Can you believe it when the only goal of China is to take Taiwan? Can you believe it when China said recently that it opposes any official contacts between countries and Taiwan? You can read this article (see the above link). The end is also very interesting, especially about the influence the KMT general secretary has on the government and public institutions (EPA). Obviously, nothing can be done about the ECFA. It will be signed. 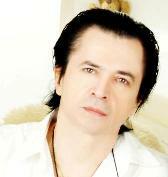 But about violence, I do not believe that proposing means to fight against violence when it is erupting, is a solution. It is like fighting against temperature by breaking the thermometer. We don’t see anymore the fever but it is still there. What people have to do is fighting against what may create violence. People should cherish talks, ideas and negotiations. Not fistfights. People from the majority but also from the minority. Many times, M. Ma was accused as the former mayor of Taipei or as the actual president of Taiwan (not only for breaking the law). Usually, scapegoats were found and even one went to jail. Today in the news (HERE), we learnt that a pharmaceutical company, China Chemical & Pharmaceutical Co (CCPC) was fined TWD100 million (more than USD3 million). Simple: from 2001 to 2004, this company sold directly or indirectly drugs to Taipei City Municipal Hospital for an amount of TWD140 million (about USD4.5 million). Uh… What is the problem? Again, simple: this company violated the law by making business deals with the city government while the mayor of Taipei was a member of the Deputy Manager’s family. Who was the mayor of Taipei at that time? Who was the Deputy Manager? The oldest sister of M. Ma. Are these activities covered by criminal laws? Logically yes. If yes, will this former Deputy Manager be convicted? To make any deal, two sides are needed. What’s about the other side, I mean Taipei City? Will only the company be fined and manager(s) convicted? Will Taipei City Hall be involved too? Will the mayor at that time be involved (convicted) too? Oh, I know what you are thinking about. M. Ma, when he was the mayor of Taipei, did not know that her sister sold for more than USD4 million of drugs to the City Hospital. So, he has nothing to do with that story. And maybe an obscure civil servant in Taipei City Hall will need to worry right now. Taiwan: Who Is Really In Charge? Since a while, I have a strange feeling. Is it because a new year is starting and nobody knows what will be in the box? Or does the reason lie on the feeling that nobody knows who is supposed to do what? I am wondering about the latter. It seems a good explanation. 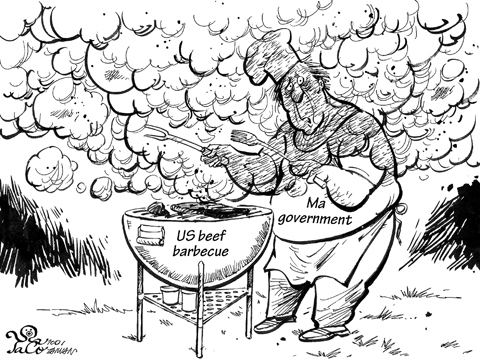 See for example: who is supposed to handle the story about the American beef in Taiwan? Any normal people will answer: the Department of Health (DOH), of course! Wrong answer my friends: it is the National Security Council (NSC). Many people ask why the National Security Council (NSC) handled the Taiwan-US beef protocol instead of the Department of Health (DOH) or the Ministry of Foreign Affairs. The NSC later said it became involved because it was a matter of national security. All this story created a real mess here. The government even decided to send a group in US (for what?). But no one could be surprised: the legislature was not informed in advance, was not consulted during negotiations, and after the signing, was required to support the decision. When the people in charge are not the one who negotiated, what do you expect about the result(s)? In other words, the government wants to transform people into a "rubber stamp". Rubber stamp, you said rubber stamp? Another mess here: the negotiation on the economic agreement between China and Taiwan (Taiwan… for how long?). Obviously, nothing was transparent and no one knows about the details except the people who are negotiating (some people don’t call that negotiation, given the fact that it’s China which decides…). By the way, who is supposed to negotiate? Uh… The Straits Exchange Foundation (SEF) no? Again, wrong answer my friends. only to sign the cross-strait agreements. Again, one more rubber stamp. And more are coming, given the fact that the lawmakers and population can do nothing. As the rabbit from the magical hat, the ECFA will come out, as the beef story did. Beside, one agreement was supposed to be signed among others, a week ago, the double taxation agreement. On the night before Chen’s arrival in Taiwan, the Ministry of Finance was ­extolling the ­virtues of a double taxation agreement, saying how determined it was to see the agreement signed. Less than 48 hours later, however, the agreement was on the shelf, put there by public opinion and businesspeople. Obviously, some aspects of the discussion (and clearly not agreement) were refused by China. And the government still insist saying that no political subjects are involved? More important, what does the government plan to do? 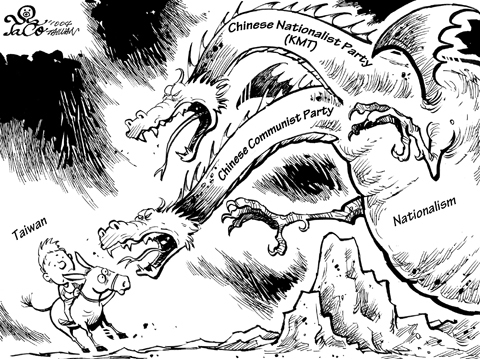 Academics yesterday lashed out at the Chinese Nationalist Party (KMT) government for what they called “a lack of concrete direction” in its policy on cross-strait relations. According to them, China will be in charge of Taiwan. Not its government. One more example: who is supposed to be in charge of the name of Taiwanese NGO? Uh… The Taiwanese NGO, no? And as you can guess, the name should include “Taiwan, China”. So, let’s go back to the initial question: Who is in charge here? Clearly, it is not the people who are supposed to. Beside, look at the shape of the sign. A “cloud bringing bad weather”?